Get outside and play this summer! This is a fun challenge to re-cap the best moments of summer. We are focusing on all of the activities that are getting you outside this summer. Show us what you have scrapbooked, carded up, or artified around sports, fishing, camping, kite flying, hiking, boating, sandcastles, and fireworks! Leading the group is Claudia, while she reminisces about time at the beach. Okay, okay...I may have stretched this...but collecting shells is a kind of sport too, right? Especially when it is too hot to play tennis. So here is my "& more" tag with faux shells I have made using the gorgeous "Shocked" stamp from Emerald Creek! I love this challenge because outdoor activities are probably my favourite part of summer! I could have chosen from any number of subjects, but because I have some new and fun camping photos, I just had to scrap one of those. 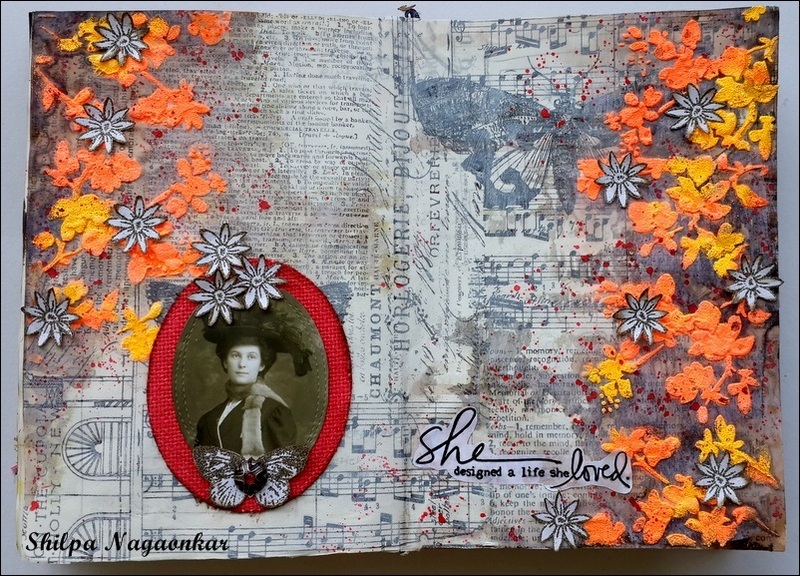 It was fun to also challenge myself to use the Emerald Creek products on a 12x12 scrapbook layout. I hope you can check out my process video! I am not normally an outdoorsy person...but anything to do with the beach will get me outdoors and when my kids were younger we did a lot of camping!! Definitely some great memories from the only outdoorsy stuff I do. LOL! Summertime outdoor activities, especially in Canada with its' coastlines and waterways, more often than not have some component of water to them. Whether it be swimming, boating/canoeing/kayaking, or fishing... surf and sand likely play a part, thus I created a card reflective of that. I personally love that calming feeling water brings and the feel of sand between my toes. 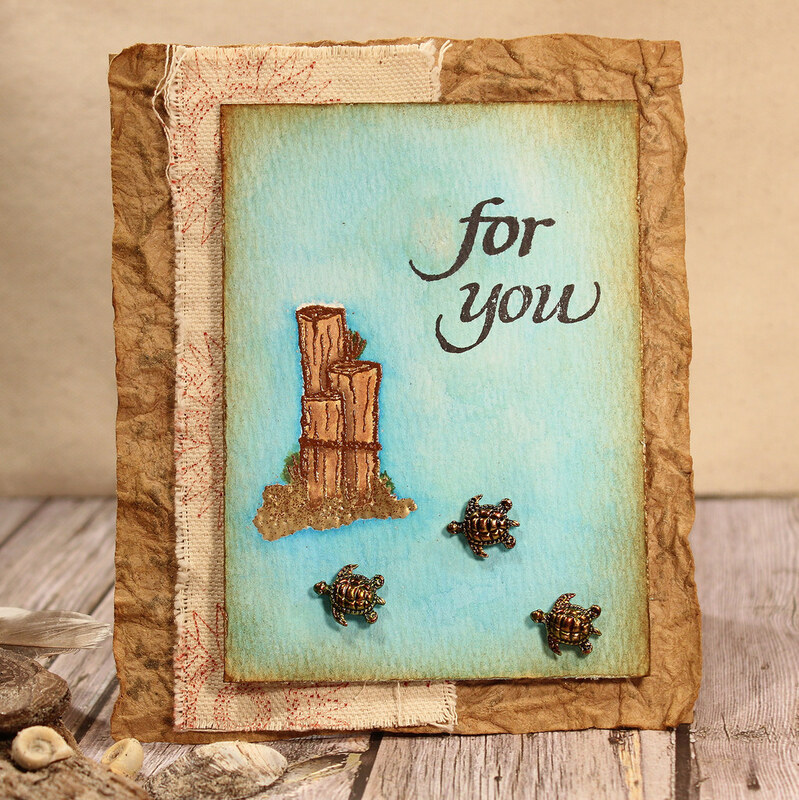 If you look carefully along the exposed distress crinkled kraft paper, you will see what looks like sand but is in fact Antique Gold embossing powder that has been adhered and slightly heat activated but not set. It has an awesome faux sand look and texture. Adding a compass for adventure and a few aqua friends round out my scene. Nations Celebrated Dare with her Free and Brave Mixed Media Layout . 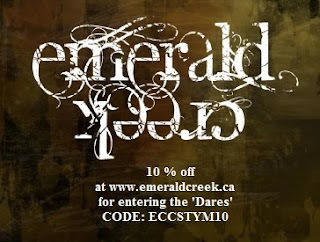 Autumn please email Kim at info@emeraldcreek.ca for your prize code. Second Chance Change Up - Guest Feature! and I am so excited for this guest! I met Jessica via Nicole Wright through Instagram. (I know, what a shocker, that's how I met most of you.) By CHA 2016, I hit a snag and Jessica was one of the first to offer to lend a hand, however, family, work and Phoenix mad it just a bit too hard for her to get to Anaheim. Since then, Jessica and I have chatted about her guest spots, CHA 2017 (where she will be helping in the booth), and many other things, including her taking me junking to her fabulous places that we don't have here in Canada. Anyway, we currently have a challenge theme of 'Blast from the Past' and Jessica wanted to jump on board. Today she re-created one of her old projects using some Emerald Creek products on it and we it is terrific. 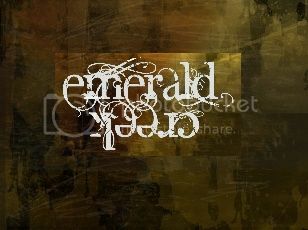 I am so excited to be guest posting for Emerald Creek Designs today. Because the current theme is bringing back past projects to highlight our favorite work, I picked this one and included a bunch of Emerald Creek Powders. don't miss seeing more details over at my blog Two Mad Dahlias. The current challenge they have running is Blast from the Past-Anything Goes. Don't forget to comment on Jessica's blog and to pop over and play in one of the 2 current challenges, Nation's Celebrated & Blast From The Past for your chance to win! Well here's my most fun challenge yet! As I flipped through some old ATC & project albums from my uncle, it hit me. We are so busy making new techniques we forget about some of the greats from the past. Check out some of these from the last 2.5 decades. To add to your chances to win, we are doubling up the projects you can submit over the summer so check out Nations Celebrated and enter your creations from the past week for a second chance to win. Check out some of our teams Favorite pieces over the year and then start digging through your favs that you have created and blogged. Still my favourite project I did so far for Emerald Creek Dares! 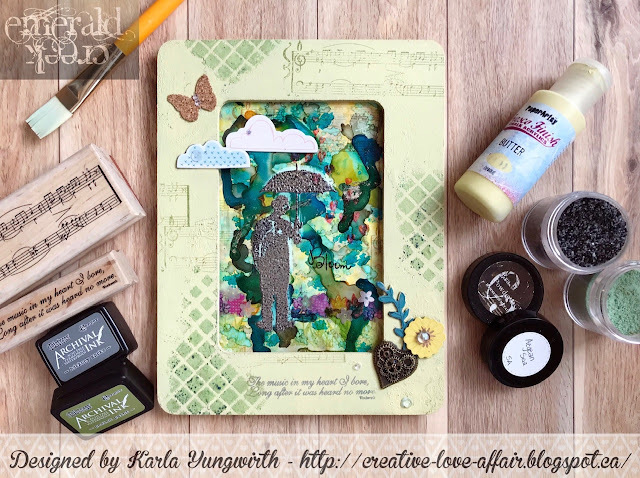 Loads of Distress paint and yummy Emerald Creek embossing powders on there! Yay! 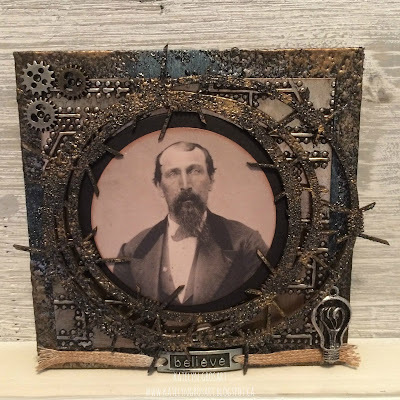 For the Blast from the Past - Anything Goes challenge, I decided that I would repost my Grungy Mixed Media canvas as it's still one of my favourite projects that I've created for Emerald Creek Dares. A variety of embossing powders and charms from Emerald Creek, compliment and finish this piece perfectly! The Past and it's Christmas in July!! I chose my Spirit of Christmas because it is one of my favorite cards and I am addicted to the teeny Emerald Creek Pine cones! And so many embossing powders that everyone should have in their stash. I had done this journal spread in April this year. I loved how Emerald Creek Neon Embossing powder pop out against black/grey background. With no Paper used we Have a Winner!! This Challenge was probably the most difficult I have extended and will once be brought back again at some point. I love how it inspired and pushed the envelope. Our Runners up are Niki and Sara. These 2 ladies are amazing in their art abilities and inspire everyone to be uplifted in their creativity. Make sure you check them out and follow them, their talents are so diverse that anyone can learn from them. Maura went really outside of the box! Actually she went to the box, the mailbox and used one of her plastic envelopes from a package. These pieces are so great and show a new way to alter a day to day product into art. I love that she has made these into trading pieces and just imagine a canvas done up like this. Maura, email Kim for your $50.00 Gift Certificate Code! I can already let you know one of Maura's pieces will be on display at the CHA Mega show in 2017. Congratulations Maura! And an awesome job to Niki & Sara. We are so excited to have Gloria with us again! I am so excited to be a guest at Emerald Creek. I don't often have a chance to play with my messy stuff, so this was time to try out some techniques from my mixed media files! I decided to create a 4th of July card for the Nations Celebrated Dare! For me, summer does not really begin until we have our 4th of July barbecue! 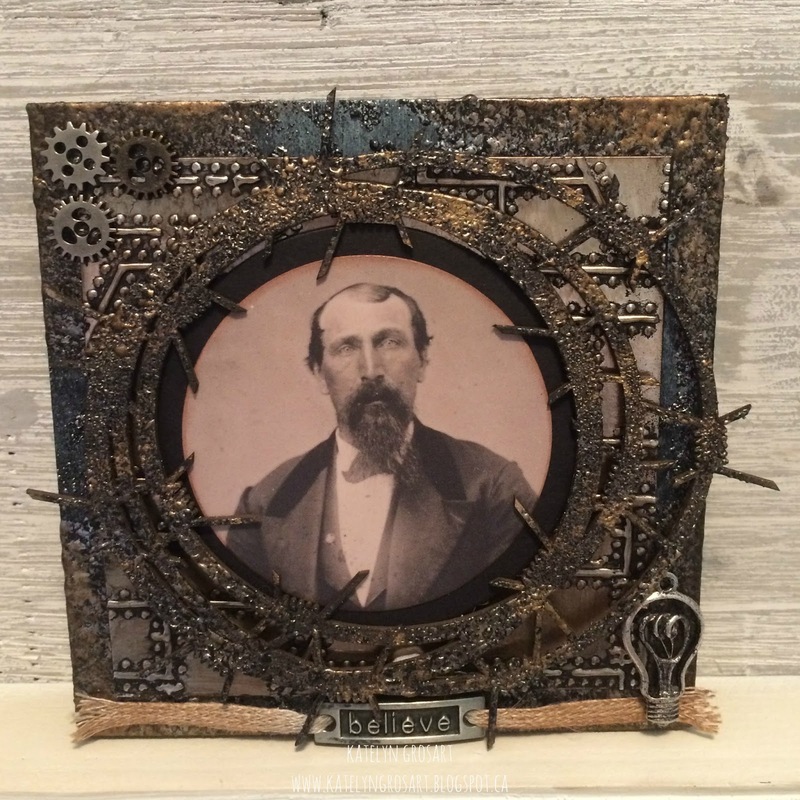 I created a vintage, mixed media card, which is a whopping 6 1/2" x 6 1/2". I created my own background paper with inks, stamps, stencils, embossing powder, paint, and more! Thanks, Kim and Team for having me as a guest!